Sticking with the current strategy of mixing things up, we decided to pick another new hiking location for Halloween weekend. 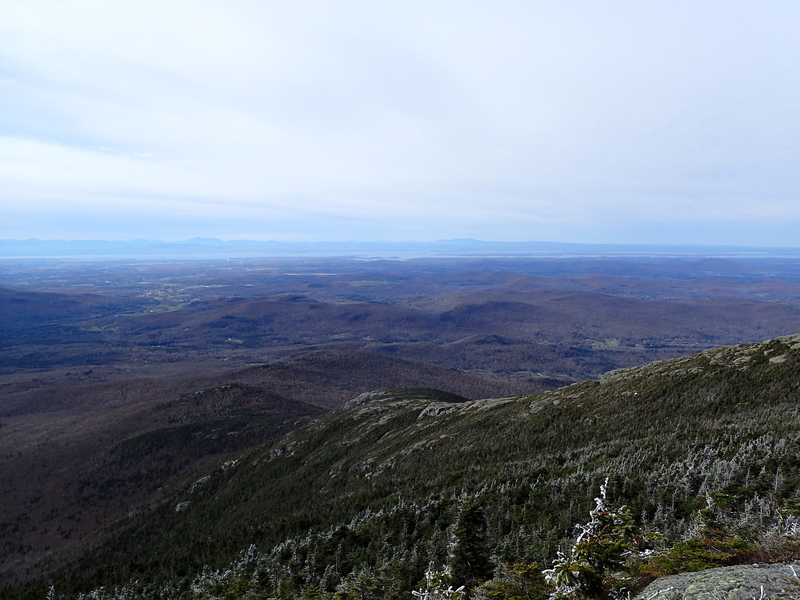 I have been to Vermont plenty of times over the years either just passing through on my way to New Hampshire or for skiing trips when I was younger but I have never actually hiked any of its peaks, so it seemed like an excellent choice for Halloween weekend. Kelly and I left NJ late Friday night headed for South Burlington where we were staying. The drive was uneventful overall but nearing Vermont we did get pulled over by a very friendly officer for going “37 in a 25 down the hill” which was awfully convenient. Lucky for me though after informing the officer we were not in town for a concert but instead hiking, and after the officer noticed that it was my birthday I was let off with just a warning, happy birthday me! If you find yourself driving through this area I would be mindful of the local speed limits as they tend to change frequently between 50 and 25 mph. We woke up at a reasonable hour and after a quick breakfast headed over to Underhill state park which was where the trailhead we decided on was located. 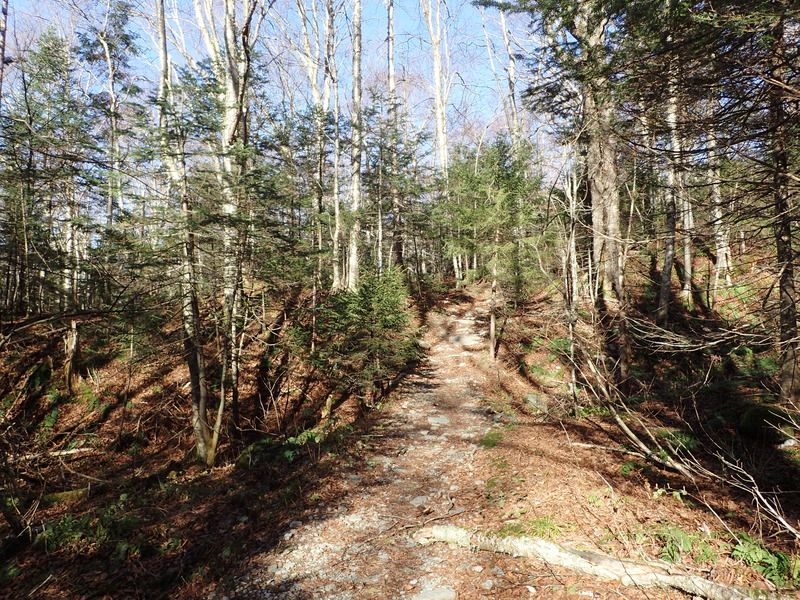 Mt Mansfield is accessibly from both the western and eastern parts of the mountain, so there are many options you can choose. From what I understand the western side is generally a little easier than the steeper eastern side, although I cannot say for sure from personal experience. Underhill state park was easy to find and we got to the parking lot in no time. 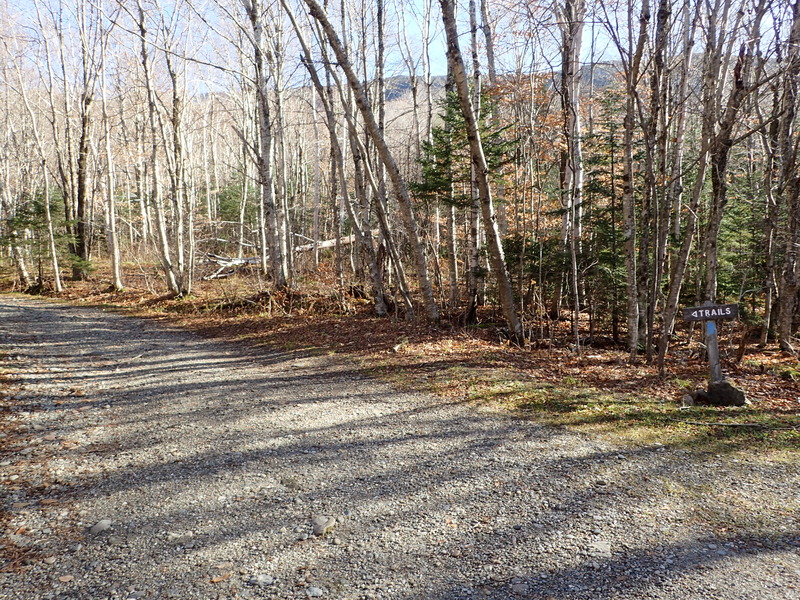 The parking lot is split into an upper and lower lot, with the trailhead being directly adjacent to the upper lot. It was not very busy when we arrived around 11 am and we were able to park in the upper lot. After gearing up we were ready to hit the trail for a nice hike in the unseasonably warm and beautiful weather. The start of the trail is not very well marked as it doesn’t actually say where it leads but the trail you want to start on is the Eagle’s Cut Trail. Alternately you could follow the road off to the left of the parking lot, but that only adds more miles with no real benefit. 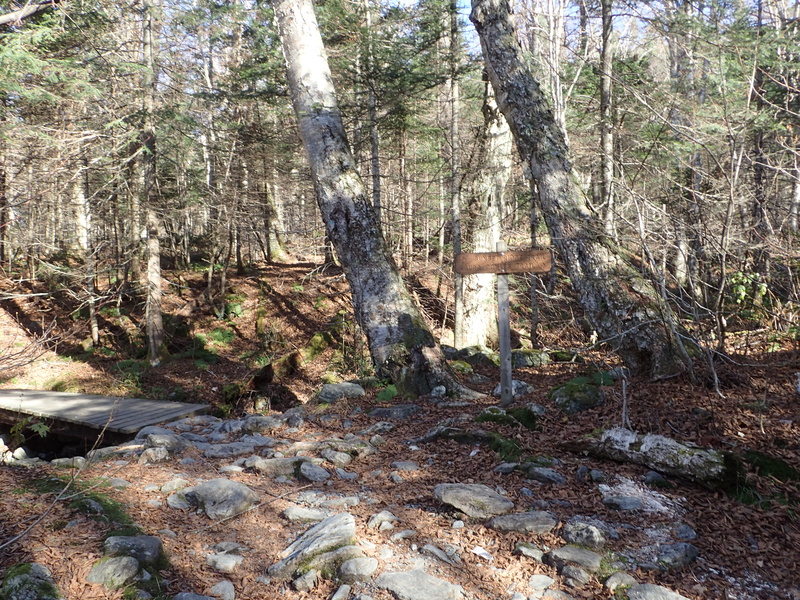 Start of the trail for Mt Mansfield. 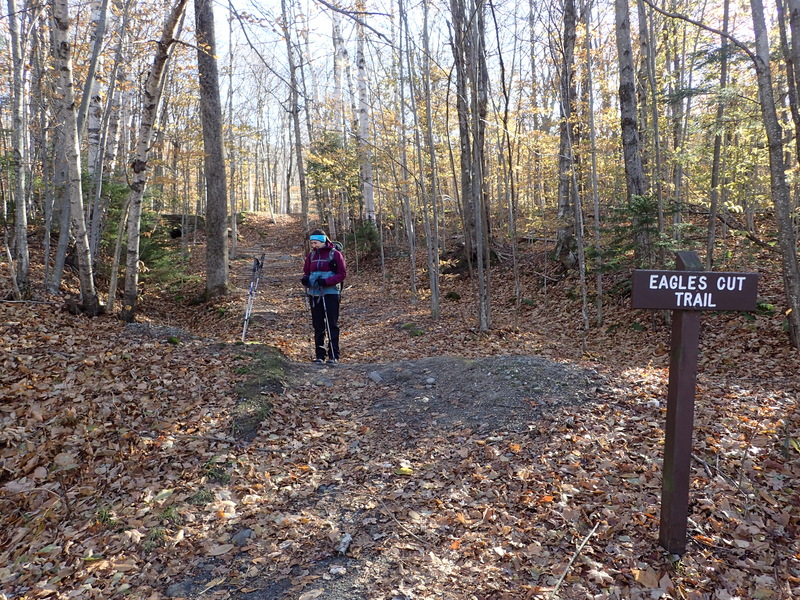 The start of the trail is very mellow as the Eagles Cut Trail cuts a path straight up the mountain to the true start of the trail, passing over the road as you go in and out of the woods. This part of the trail serves as a nice warm up for the day. Trail crossing over the road. This section of trail is about 1 mile long and the time passes quickly on it since it is relatively flat. After crossing in and out of the woods a few times we came to the end of the wooded section and made a turn up the final section of road. Sign leading the way up the final stretch of road. 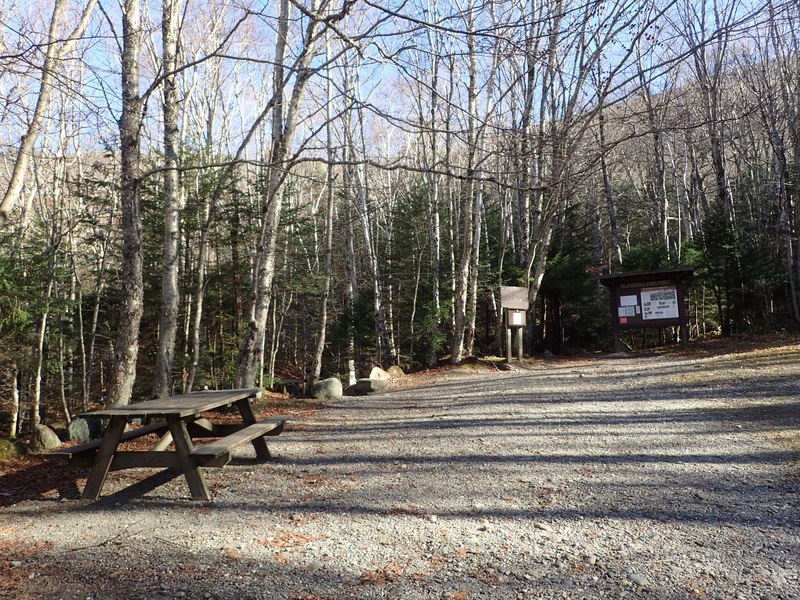 After only a few more minutes on the road we reached a small clearing with a picnic table and trail register leading up the trail proper. One thing I noticed was that almost no one here signs trail registers apparently which I found odd. I understand its a short and easy hike but why not just be safe and sign the book? Trail register and the start of the actual trail. The hiking starts relatively flat as you cross several bridges over small brooks before reaching the first junction along the way. Flat trail leading away from the trail register. 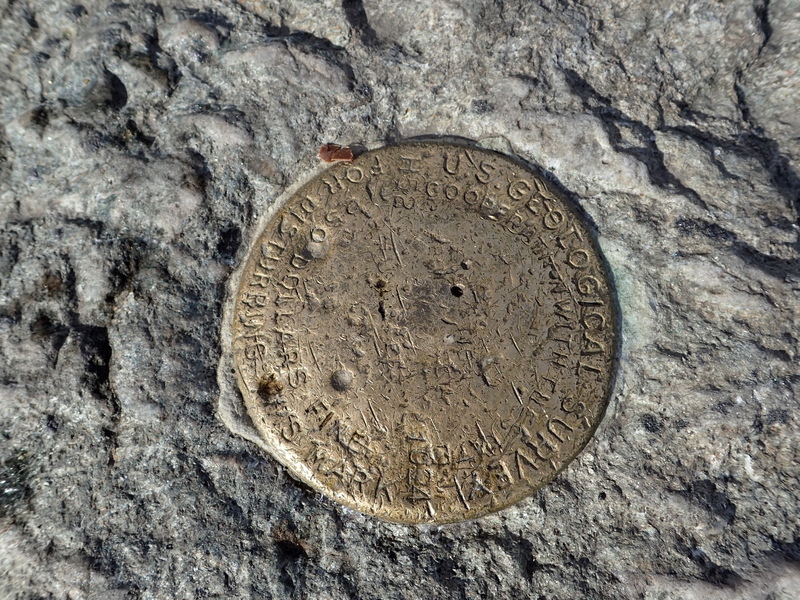 The trail junction gives you two options on reaching the summit of Mt Mansfield. You can either go left up Sunset Ridge which is very pretty and more mellow but does add slightly more mileage. The trail on the right leads you up the Laura Cowles Trail which is shorter but also much steeper overall. We decided to go up the Laura Cowles trail and then down Sunset Ridge so that we get the best of both worlds. Doing it this way also meant that the beautiful views from Sunset Ridge would always be in front of us instead of behind our backs. Trail Junction for Sunset Ridge and the Laura Cowles Trail. After starting down the Laura Cowles Trail the trail becomes considerably steeper but is still in very good shape and easy to follow. 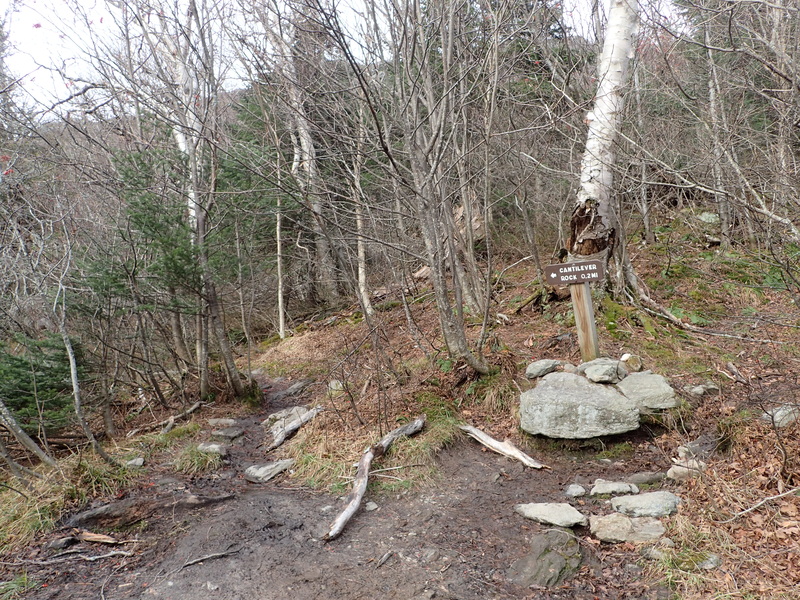 One other nice detail about the trail is that overall it is quite dry and lacks a lot of the mud that is so common in the Adirondacks just across Lake Champlain. Start of the Laura Cowles Trail. The Laura Cowles Trail follows a nice path along the side of a brook before eventually becoming steeper and moving away from the brook proper. At this point there was some water along the trail but it was pretty minimal and we only ran into a couple of places that were icy. However, since ice was expected we had our micro spikes ready to go so we put those on just to make things easier, although plenty of people climbed Mansfield that day without them. Going forward I would expect they would become pretty mandatory as winter starts to creep in. The trail getting steeper as you get closer to the top of the ridge. 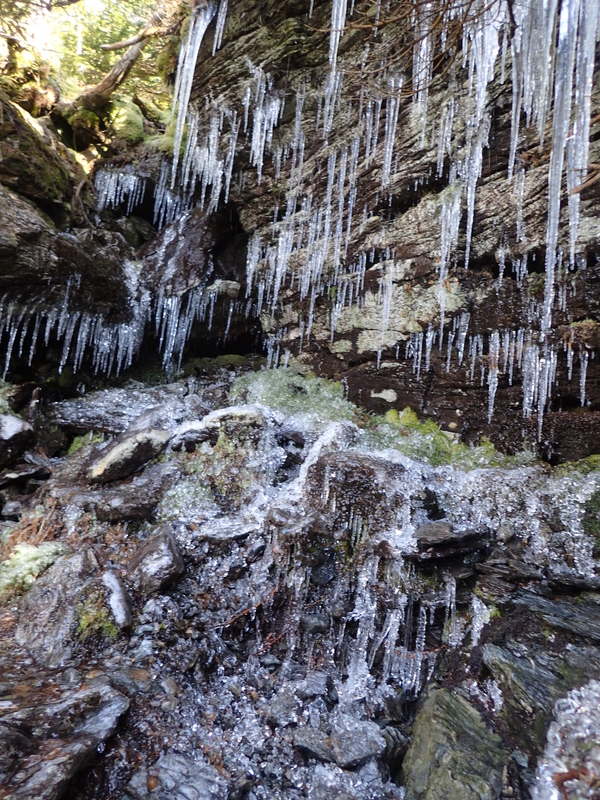 Beautiful ice accumulation just off the trail. Despite the steepness we made quick work of the trail leading up as it really isn’t very long and the micro spikes gave us confidence to move quickly. Before too long we were beginning to reach the crest of the ridge. Nearing the top of the ridge. 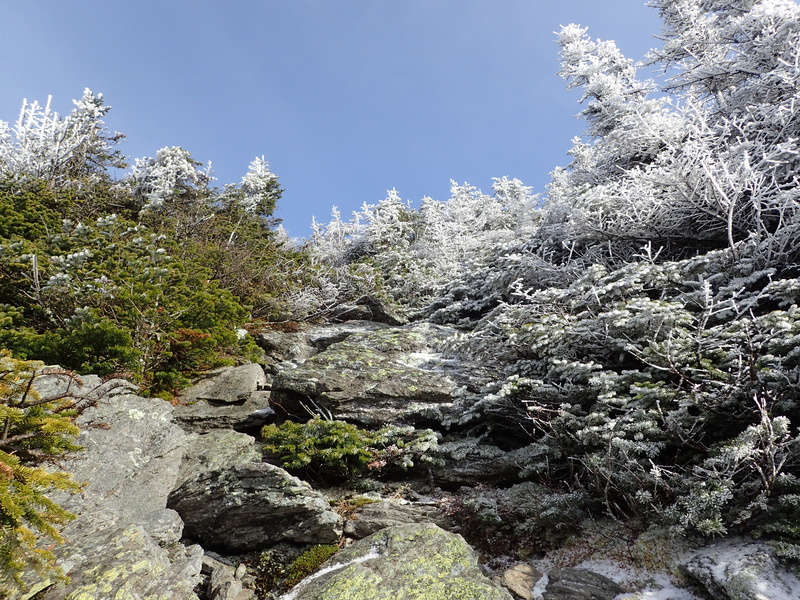 Some of the trees were a little frosty but otherwise there wasn’t much snow or ice on the ridge. A short scramble up some talus and we found ourselves at the top of the ridge which was also the intersection of the Sunset Ridge Trail and Laura Cowles Trail with the actual summit trail. 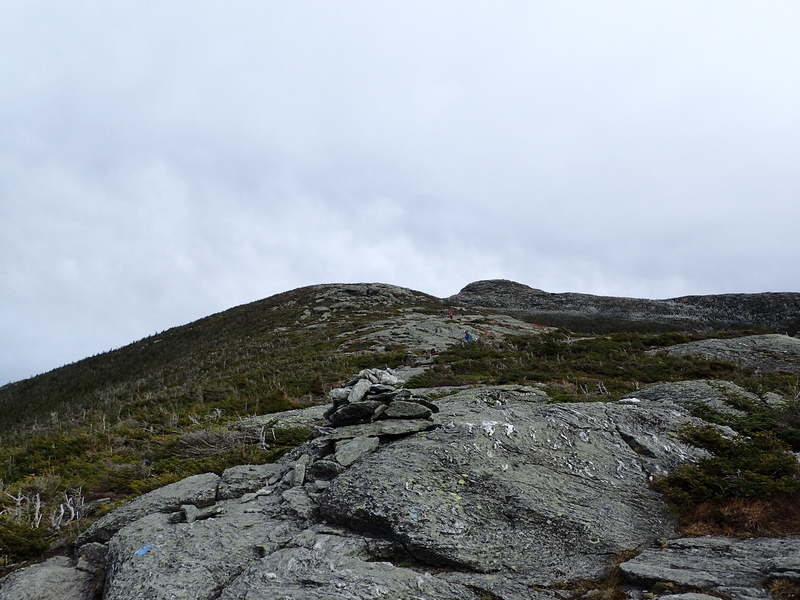 From this point you are also mostly above the tree line and we got our first views of the beautiful scenery. 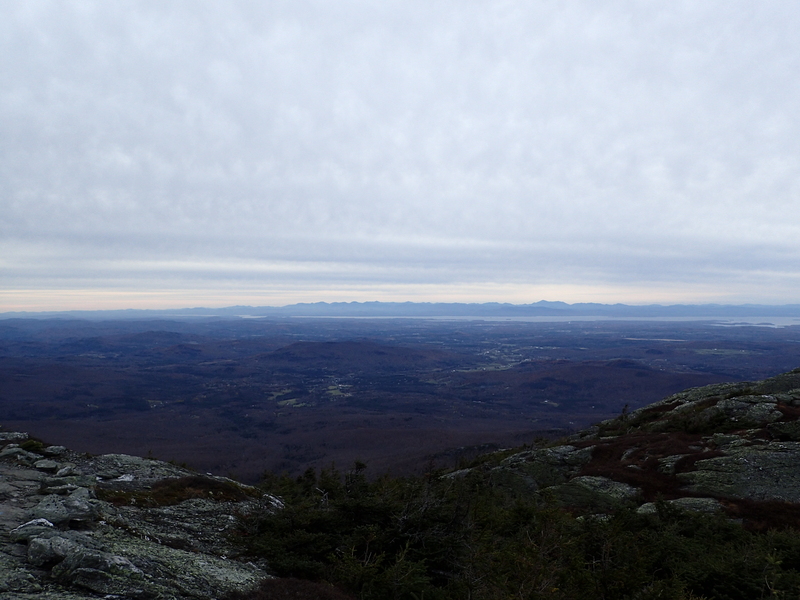 First view of the Adirondacks and Lake Champlain in the distance from the ridge of Mt Mansfield. Kelly taking in the view from the ridge. After enjoying the views it was just a short walk up to the actual ridge proper. 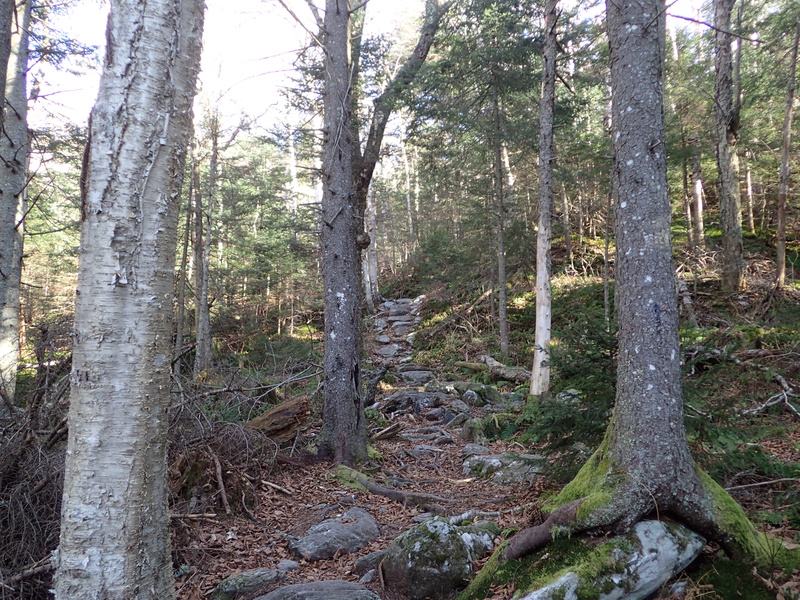 At this point you also run into the summit trail and the Long Trail which leads from the opposite direction. The trails aren’t very well marked but you want to stick to the left for the actual summit trail. It makes sense when you see it in person so getting lost isn’t really a possibility. 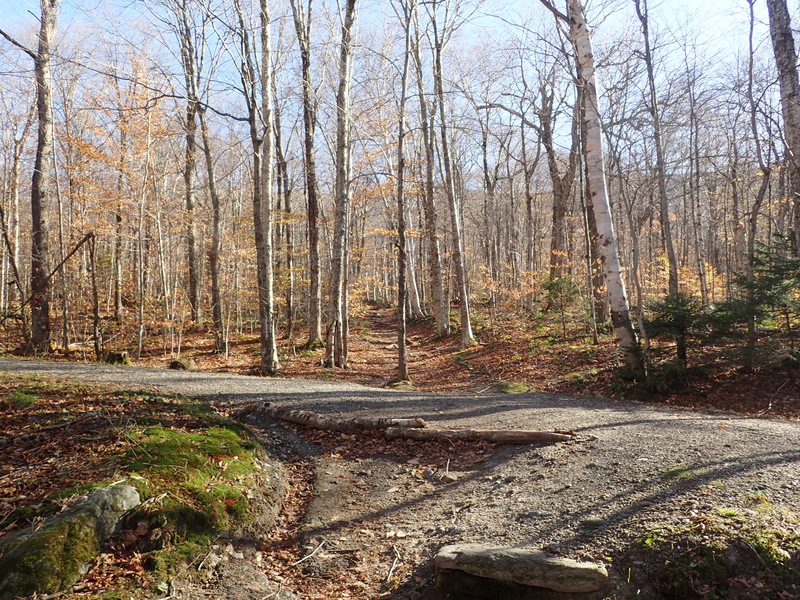 Junction of the summit trail and Long Trail. Once we got up to this point we started to see quite a few people. I did ask a couple to stick to the boards and not walk on the fragile alpine grass, so apparently I’m officially that guy, but at least the grass was safe! 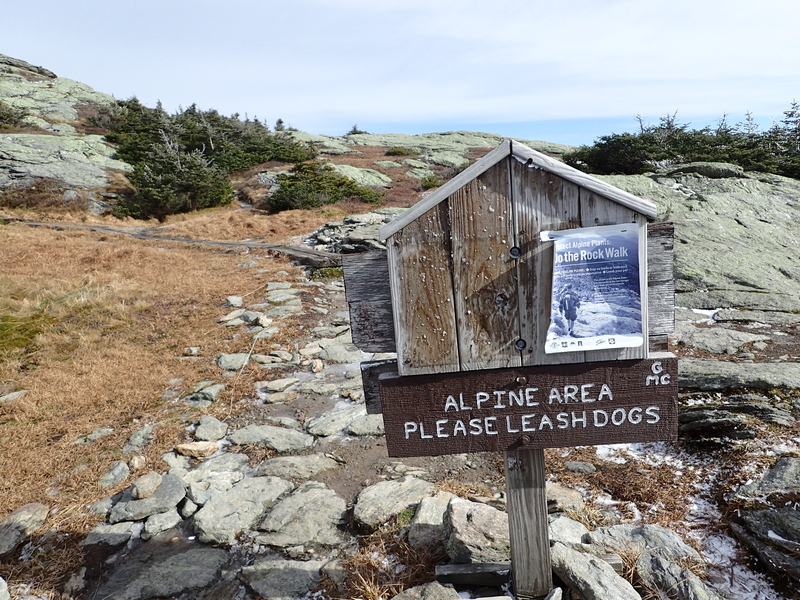 At this elevation there was still only intermittent ice and no so we made quick work of the last stretch of trail. 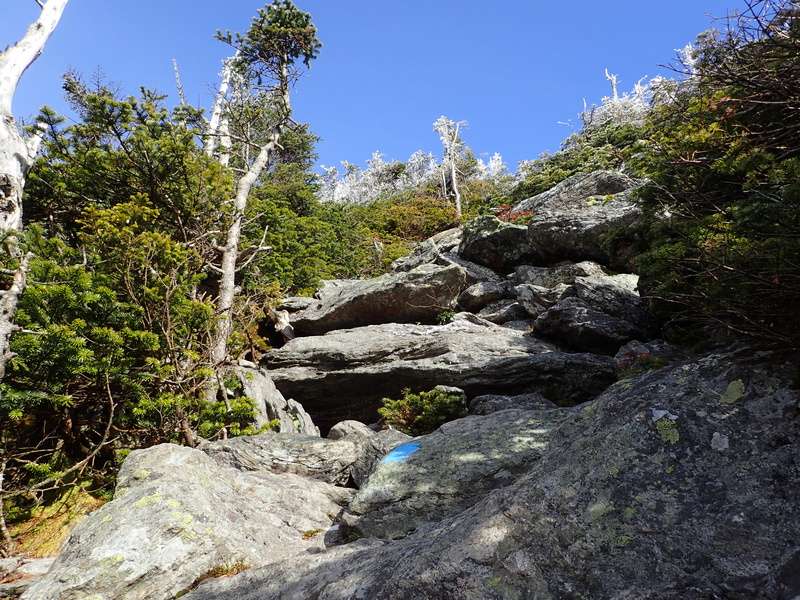 Also once up on the “chin” near the summit you get really great views looking back down the trail as well. 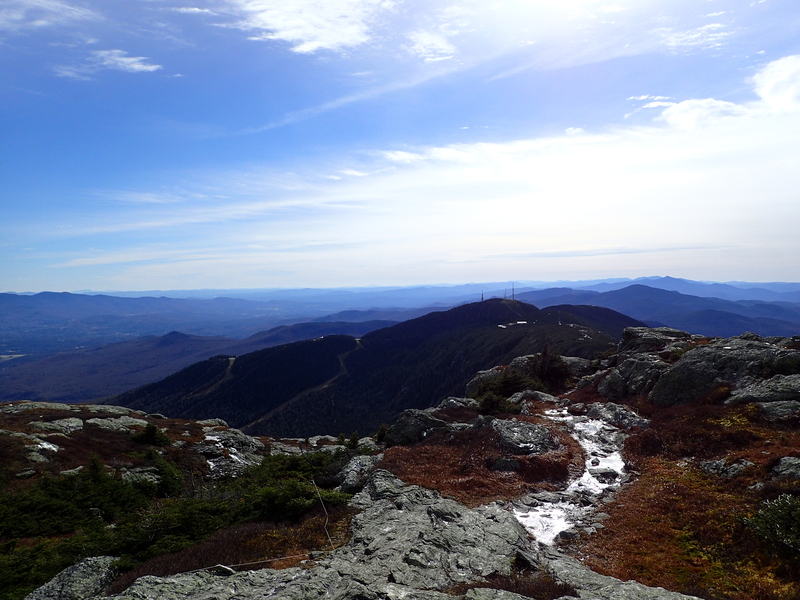 Looking back towards the Nose on Mt Mansfield. The nose has quite a few antennas on top but from this distance it doesn’t really detract from the views and also as a side effect you will have perfect cell reception throughout the entire hike. 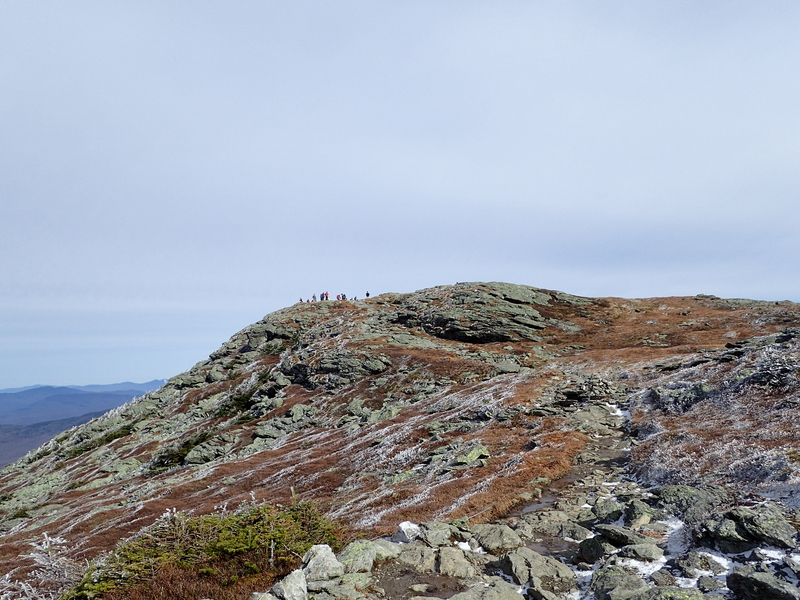 As we approached the summit we could see there was quite a crowd on top, but that was not surprising given how warm it was and the fact that the wind was hardly blowing at all. The lack of wind was really unusual for this particular peak and for mountains in this area in general, so I guess we just got very lucky. We arrived on the summit only a couple of hours after we had started. 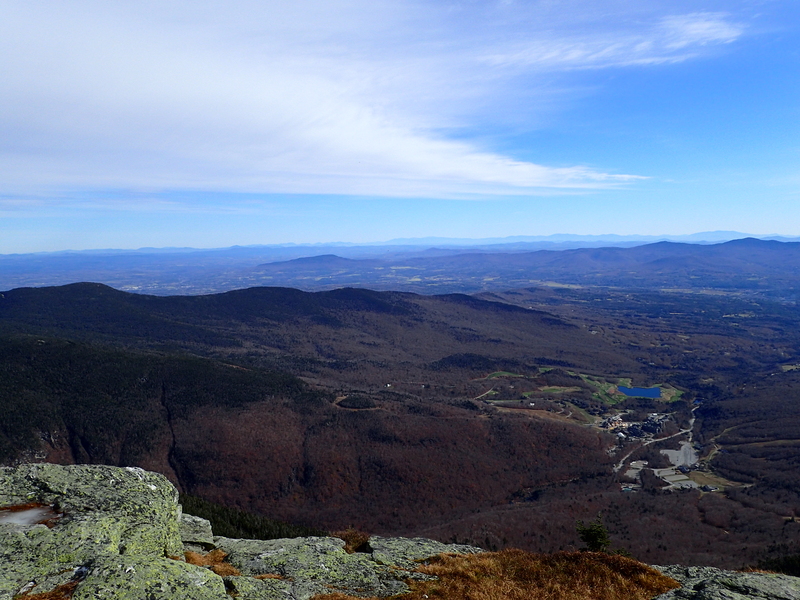 It was calm, windless, and sunny on top, which is everything we could of asked for. After snapping a few pictures and taking in the views we relaxed for a while before heading back down. 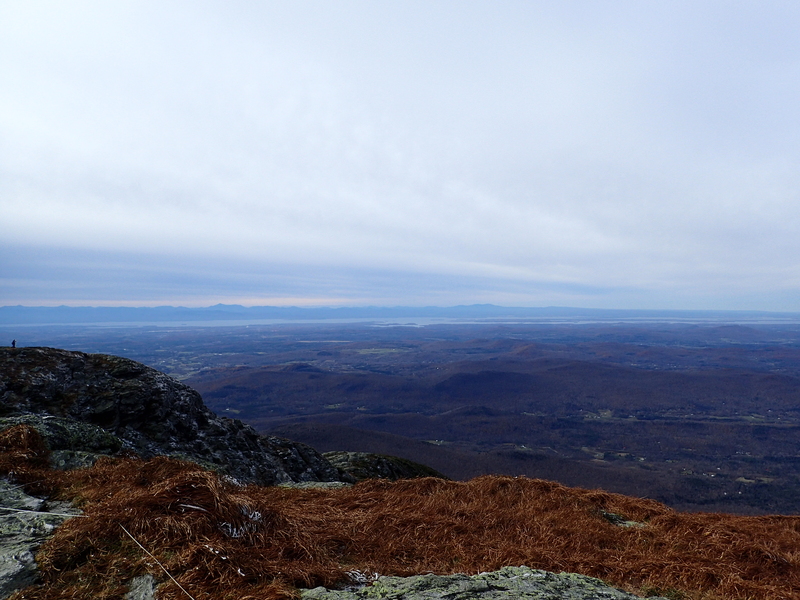 It was really great being able to see Lake Champlain and the Adirondack High Peaks from this direction. From this direction they look even bigger and more imposing than they do up close, which could explain why they were left unexplored for so much longer than other mountains in the area. Looking east towards Stowe ski resort. 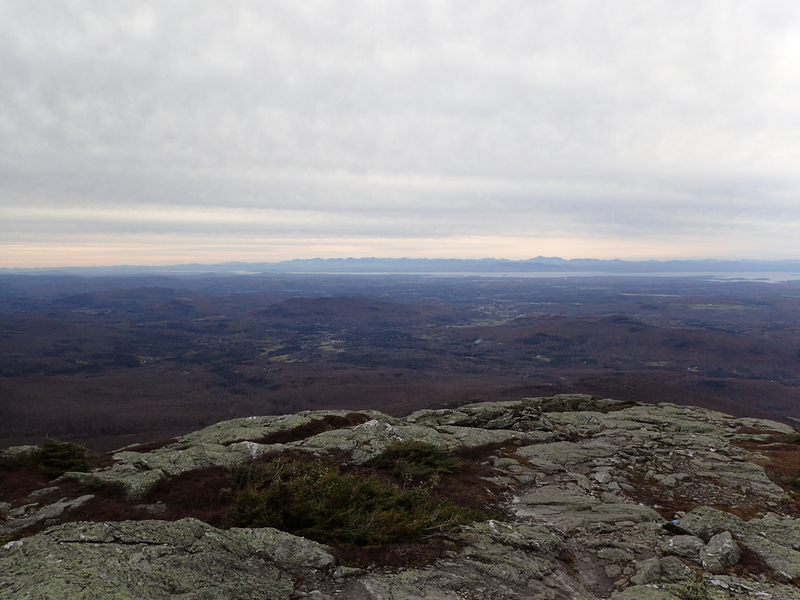 Looking west towards the Adirondacks and Lake Champlain. It was hard to get up and leave the summit but it was getting later and we were both ready for a hot meal! We back tracked down the chin and back to the trail junction with the Sunset Ridge Trail which was our planned route back down. This section of trail near the top of the ridge actually turned out to be fairly icy so I was glad we had our micro spikes. Throughout the day we ran into more than one person who had taken a nasty fall on the ice. 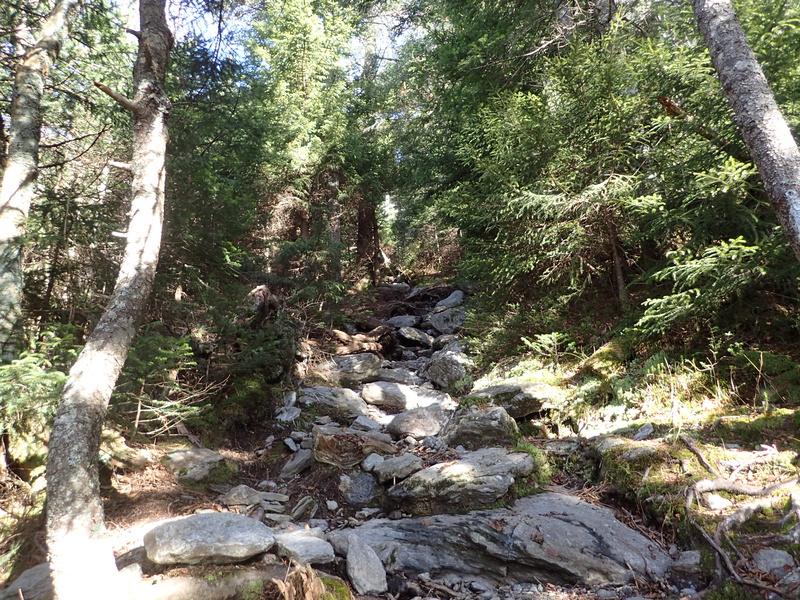 The trail itself, at least the upper section, is primarily just a rock slide with intermittent vegetation. As a result of the lack of vegetation you get beautiful views all along the trail for quite a while. It turned out to be a great choice saving the Sunset Ridge Trail for the way down so that we could keep the views in front of us the whole way. Looking down the Sunset Ridge Trail near the top. Looking back up the way we had come down the Sunset Ridge Trail. The Sunset Ridge Trail is not very difficult and overall I would say it is much easier than the Laura Cowles Trail as it has a much easier grade. Ice wasn’t a major problem for us and the micro spikes definitely helped, but going forward I would be sure to have them as there is a lot of potential for problems without them. After a short hike down the Ridge we dropped back into the trees and made the final push back to the trailhead. The trail from here is in great shape and only had very minimal muddy and slippery sections. The trail also got progressively easier and flatter as you approach the trailhead. The only other interesting thing we passed on the way down was a trail junction for Cantilever Rock which sounded cool but sadly we did not make the time to see it. I will be making it a point for my next trip up Mansfield. Trail junction for Cantilever Rock. It took us about the same amount of time going down as it did going up, but we also spent at least 30 minutes or more enjoying the views along the way. 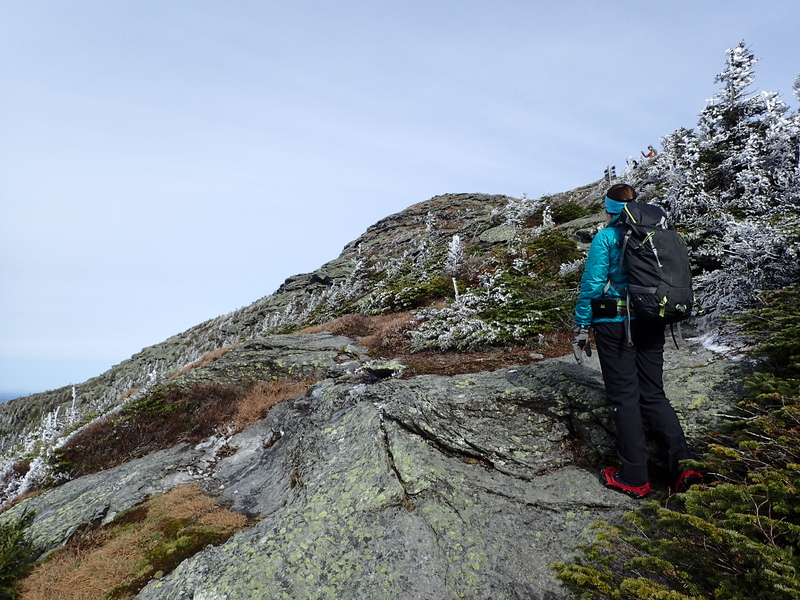 Mt Mansfield was a great peak to do as it wasn’t very hard but also offered incredible views. If I lived closer I could see myself climbing it several times a week just for fun. In the end I would highly recommend this peak for anyone in the area that wants a fun but fairly easy outing with excellent views.